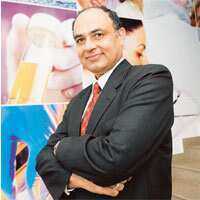 Preparing ground: SRL Ranbaxy chief executive Sanjiv K. Chaudhry. In 2002, after middle-distance runner Sunita Rani tested positive for steroid use at the Asian Games in South Korea, administrators of Indian athletics turned to SRL Ranbaxy Ltd for a second opinion. The medical diagnostic company cleared the medalist’s name—and in the process, the idea for a new business was planted: Why not localize and commercialize athletic drug testing in India? Because India does not have a single facility with the globally recognized World Anti-Doping Agency (Wada) certification, Ranbaxy is expanding its laboratories and testing capability with hopes of gaining it. Local sports authorities currently send athletes’ urine samples to certified centres abroad for a dope check. But SRL Ranbaxy is not alone. The state-run Sports Authority of India (SAI), which develops both sporting talent and infrastructure, is setting up a laboratory at New Delhi’s Jawaharlal Nehru Stadium. Wada’s certification is expected by June, says Indian Olympic Association (IOA) secretary general Randhir Singh. This is a month after Wada officials at a meeting in Iceland urged India to implement a proper drug-testing programme. “The next cricket World Cup will be hosted by India along with other countries in the subcontinent in 2011 and it will be in the fitness of things if specialized testing is available by then," Wada director general David Howman said at the meeting, according to Indo-Asian News Service. Wada did not return an email to its Canada headquarters for comment. For both certification and to drum up business, SRL Ranbaxy—a joint venture of Ranbaxy Laboratories Ltd and Speciality Laboratories Inc.—has begun a Rs2 crore upgrade of its Gurgaon laboratory, among the 40 it has nationwide. Already, SRL Ranbaxy, based in Mumbai, has been signed up by the promoters of the Indian Cricket League (ICL) to check players for doping. It also sees an opportunity in the 2010 Commonwealth Games in New Delhi, and wants to obtain the Wada certification before the Youth Commonwealth Games in Pune next year. “We are in the pre-application plane," says chief executive Sanjiv K. Chaudhry. “We have got the Wada requirements and will hopefully meet the standards." The goal, he says, is to create a permanent, commercial service marketed to sports federations, organizers of sporting events and athletes. Dope testing is an event-related business, and never the mainstay for Wada-certified labs. It’s impossible to sustain as a single business for events only held every one or two years, says Chaudhry. Each sample test costs $200 (Rs7,800); logistics such as collection and transport cost more. Worldwide, dope testing is a $1 billion market annually, Chaudhry estimates. As steroid use becomes harder to detect, drug testing in the country will need to become more sophisticated, says Dr Bharat Inder Singh, the India representative on the Wada board and the sports medicine specialist at Ranbaxy-promoted Fortis Health Care Ltd.
For example, he says, SAI’s technology can identify steroids but cannot pinpoint their source, meaning if they are naturally produced within the body or ingested. Generally, test samples during athletic meets in India are sent to the SAI facility. If drugs are detected, the samples are sent to Bangkok. Events such as cricket matches don’t have such tests, though the Board of Control for Cricket in India doesn’t rule it out in future. “We are concerned about this, we know what to do but we won’t go to a private agency," says the board’s chief administrative officer Ratnakar Shetty. Hockey federation secretary general K. Jothi Kumaran says his organization would consider SRL Ranbaxy’s services when the Premier Hockey League, which started on Thursday, is conducted next year. The federation usually goes through SAI, he says. IOA president Suresh Kalmadi, Chaudhry says, has been “very receptive" to SRL Ranbaxy’s plans, but IOA’s Singh said he was not familiar with SRL Ranbaxy’s bid. Chaudhry’s optimism stems mainly from the company’s one-time successful role in anti-doping tests. After Rani, a winner of a gold in 1,500m and a bronze in 5,000m at the 2002 Asian Games, had to surrender her medals, the Amateur Athletics Federation of India approached SRL Ranbaxy on her behalf. Following the new report, the International Olympic Committee (IOC) sent both results to another Wada-certified facility in the US, which confirmed SRL Ranbaxy’s findings. The athlete had indeed not used drugs. Then days before ICL began inaugural matches on 30 November in Panchkula, media baron Subhash Chandra’s Essel Group, promoters of the league, contacted SRL Ranbaxy to set up the requisite facilities. SRL Ranbaxy had little time to implement a process, but sent representatives to observe and coordinate logistics. It promises its Gurgaon lab will be ready for the next tournament in March.